Last night i went out with my friends Dal and Jess in Clapham, We lost our lives a little bit but we always have the best times and above is what I wore. We chilled up on our balcony for a bit, while we don't have an amazing view (it backs on to houses!) so nice to spend a warm summer evening up there. I've got a huge thing for shorts at the moment and literally cannot stop wearing them. I used to hate them but they've totally grown on me andI cant get enough of them! These Topshop boutique lay unworn for far too long, but I feel like I've wore them most days recently! 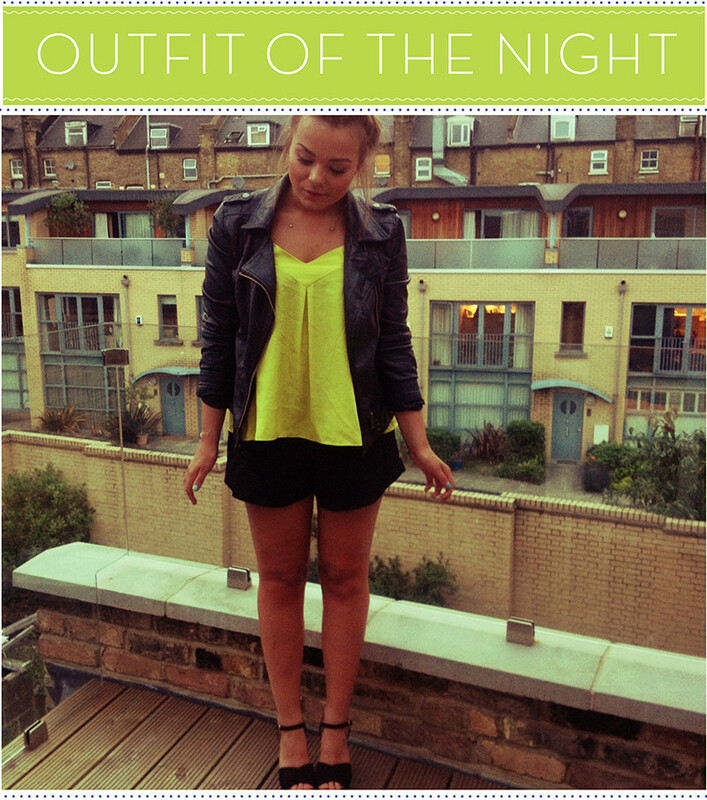 Paired with my favourite bright swing vest from River Island. I went into River Island with the intention of finding it in a few other colours but they didnt have it! I'd love a red and a black one to add to my collection. And if you wanted to see my fave before and after then check out my Instagram here. Instagram photos will be gone as of tomorrow and normally outfit photos will resume. I feel like such a cop out doing them so much recently but I didnt take my camera on holiday with me this time so couldnt really do proper ones. Im gonna be working on my photos a bit over the next few weeks and switching things up a bit so I really hope you enjoy them. I'll be back later with another update, Sunday post type thing but I thought I'd leave this here as well as i nevber post enough night out outfits! I love that top and the leather jacket together, it looks lovely. Lovely outfit - simple but effective! Love the bold neon top. Shorts definitely suit you! Love this outfit - especially the top, its a really nice colour! Great outfit post! Agree, the top in red would be awesome! I love this outfit, very simple but very stylish. I don't mind instagram pictures on blogs, Nobody has time for a full on photoshoot everyday so it's just nice to see a regular outfit post. New fashion blog with great photography and regular giveaways. Please check out and give me feedback! The bright top looks lovely against black shorts like that! Lovely Lily. Love the outfit! Your piercings look so great with the top as well. That leather jacket is the bomb. That is such a gorgeous outfit! I love the way you manage to wear that yellow cami so many times but in so many different ways. Such an inspiration to my style. Love the neon cami! Such a nice outfit!